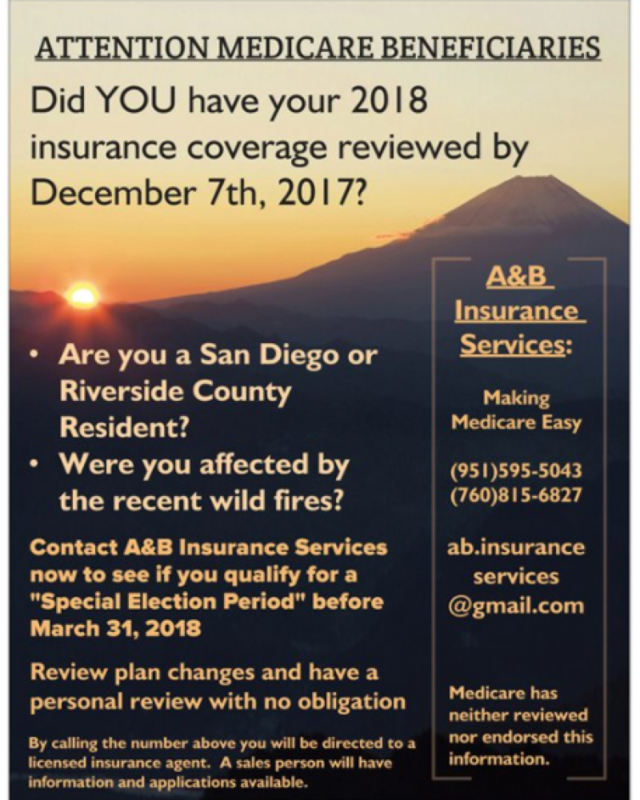 If you are a Riverside county or San Diego county resident and were unable to have your annual Medicare Insurance benefits reviewed due to recent wild fires, Medicare has issued a Special Election Period through March 31, 2018. You have a unique opportunity for your personal coverage review and may still elect to change your Medicare plan for 2018. Although the Annual Enrollment Period ended 12/07/2017, you are entitled to a personal review with a local licensed agent representing all Medicare Advantage plans accepted by Rancho Family Medical Group. Please call to find out more from a local, licensed independent broker specialized in Medicare products. *A licensed agent will be available with information and applications. There is no obligation to enroll. Medicare has neither reviewed nor endorsed this information.